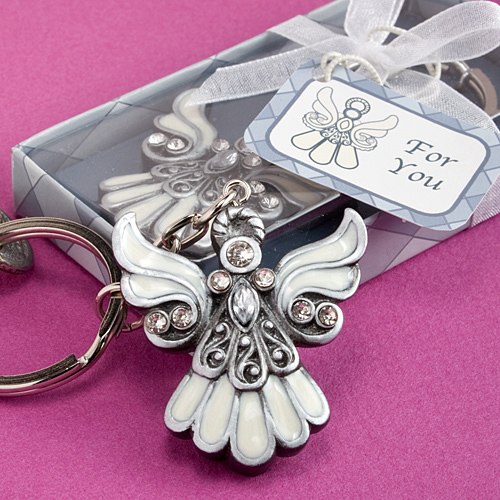 Put a charming touch on a day that's filled with joy with these beautiful angel keychain favors. Day in and day out everyone has their keys close by. So here's a way to give your family and friends and angel that will always be close by too! Each angel key chain measures 3.25" long, including chain, and features a dramatic 1.25" long x 1.25" wide pewter colored poly resin angel charm with inlaid white enamel, enhanced with carved detail and multiple glistening rhinestones. The angel charm has a sturdy chrome finish silver metal chain and ring attached at its top. An elegant addition to any religious occasion, each comes in a decorative clear topped box with a two tone silver base with a diamond pattern and angel design, tied with a white organza ribbon and an attached matching design "For You" tag.